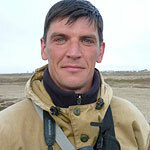 Nikolay works at Saratov University as a Zoology lecturer. He led the spoon-billed sandpiper nest searching team in 2011. He has been visiting and studying spoon-billed sandpipers at Meinipylgyno since 2003 and has found around seventy nests of the species thus making him one of the most experienced SBS field ornithologists in the world. He shares with Pavel the enviable ability to locate wader nests at will, essential to the success of the project.